The WKPC-15 summer pledge drive continues this weekend with local science-fiction aficionado Jane Dietz making her pitch for "Dr. Who" Saturday night at 9 (Storer-15). Her appearance precedes the science-fiction series, which runs for 16 weeks. 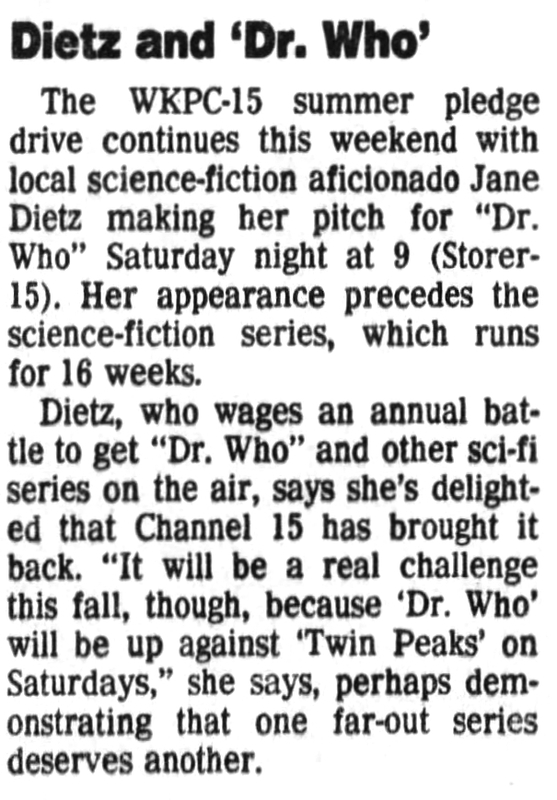 Dietz, who wages an annual battle to get "Dr. Who" and other sci-fi series on the air, says she's delighted that Channel 15 has brought it back. "It will be a real challenge this fall, though, because 'Dr. Who' will be up against 'Twin Peaks' on Saturdays," she says, perhaps demonstrating that one far-out series deserves another. APA 6th ed. : Dorsey, Tom (1990-08-23). Dietz and 'Dr. Who'. The Courier-Journal p. E2. MLA 7th ed. : Dorsey, Tom. "Dietz and 'Dr. Who'." The Courier-Journal [add city] 1990-08-23, E2. Print. Turabian: Dorsey, Tom. "Dietz and 'Dr. Who'." The Courier-Journal, 1990-08-23, section, E2 edition.